With the possible exception of the one week I spent in the spring training camp of a grubby Class D club in the Panhandle of Florida during the mid-fifties, no experience in my life has been so profound as my undying awe for the hundreds of fading outfielders and flame-throwing young pitchers and haggard managers who wore the uniform of the Birmingham Barons during the decade covering the late forties and early fifties. It began on the late-August Sunday in 1947 when my old man, a truck driver, announced that we were going to see my first professional baseball game. The Barons, stumbling along then as threadbare members of the old Philadelphia Athletics farm system (they hooked up with the Boston Red Sox the next year), were playing a doubleheader against the strong Dodger-operated Mobile Bears at Rickwood. I fell in love with it all, at eleven years of age, the moment we walked up a ramp and saw the bright sun flashing on the manicured grass and the gaudy billboarded outfield fence and the flashing scoreboard in left-center and the tall silver girders supporting the lights. I would later read that Rickwood was regarded as one of the finest parks in the minor leagues. Nobody had to tell me that. Yankee Stadium could not have been more impressive to me. Taking our seats, we became one with the crowd: hooting at the umpires, scrambling for foul balls hit into the stands, needling the opposition, ooohing when a lanky Mobile first baseman named Chuck Connors towered a home run all the way over the right field roof (yes, the Chuck Connors, "the Rifleman"). Only Ted Williams had ever done that before, my old man told me, and one day I want to meet Connors and tell him about it. The Barons stumbled through a double defeat. The second game was shortened when disgusted fans began throwing their rented seat cushions onto the field at dusk. 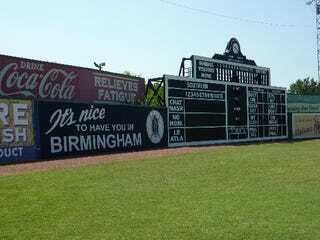 From that day on and for the next ten years Rickwood and the Barons became the core of my life. Hurrying to deliver my seventy-eight copies of the afternoonBirmingham News (first, of course, I read sports editor Zipp Newman and his account of the Baron game of the night before), I would take the one-hour trolley ride to Rickwood in hopes of arriving early enough to see the players crunch into the parking lot around five o'clock for their pregame ritual. (One day I was stunned to see that a particular favorite was a gaunt chain-smoker.) In those days the big league clubs played their way up from Florida to begin the regular season, and during one spring exhibition between the Barons and the Red Sox I out-scrambled an old wino for a ball fouled into the bleachers by Walt Dropo, my hero from the previous Baron season who was getting his shot now in the big leagues. It was a ball that we kids in my neighborhood were able to keep in play for the entire summer. We called it the "Baron ball." All night when the Barons were in, say, Little Rock, I would curl up in bed with the lights out and my radio under the covers to hear Gabby Bell's imaginative re-creation of the game; not knowing for some time that Gabby was merely sitting in a downtown studio with a "crowd machine" and constructing his "live" account from a Western Union ticker tape. Occasionally my family would load up the car at dawn with fried chicken and oranges and potato salad and tea and ride over to Atlanta or up to Memphis to root the Barons through a Sunday doubleheader in the lair of the enemy. We always bought box seats next to the Barons' dugout. One time, in Memphis, Barons pitcher Willard Nixon dropped a baseball in my lap because I was the most vociferous Barons fan in Russwood Park.